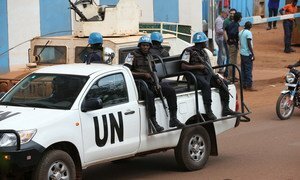 Perpetrators behind the killing of a number of people displaced by conflict in the Central African Republic (CAR) must be brought to justice, the UN peacekeeping operation in the country said on Friday. The mission, known by the French acronym MINUSCA, has strongly condemned the incident, which occurred on Thursday in the town of Bria. Alleged members of a rebel group reportedly abducted the victims, most of them women, from outside a camp for internally displaced people (IDPs) known as PK3, situated near the UN base in the town. Police from the mission are investigating the matter while MINUSCA has also stepped up security around the camp. Bria is located nearly 600 kilometres from the capital, Bangui. The town is hosting around 100,000 people, the majority of whom—80 per cent—are IDPs. Nearly 48,000 are staying at PK3, which is the largest IDP site in the country. In the wake of the killings, Najat Rochdi, UN Humanitarian Coordinator in the country, has appealed to warring parties to protect civilians. She expressed deep alarm over mounting tensions in Bria. She said that just a few days after commemorating World Humanitarian Day “we witness yet another tragedy against innocent civilians. I appeal to all parties to abide by their obligations under international humanitarian law and protect civilians. Civilians are not a target and these despicable acts must stop”, the Humanitarian Coordinator said in a statement. With Central African countries beset by ongoing terrorist activity, instability and the effects of climate change, the Security Council has asked the United Nations Secretary-General to review the work of the UN Regional Office for Central Africa (UNOCA), and recommend areas for improvement.